Tricia, her friend Erica and I got back from Comic Con yesterday. We had a blast! This year was the first for me to stay at the Marriott Marina Hotel, and boy, that sure made it a lot less tiring. The problem with the San Diego convention center is that it separated by a light-rail train and only a couple of walkable crossings over to most of the nearby hotels and restaurants. These passages are overwhelmed by the hundreds of thousands of sweaty nerds and geeks baking in the hot sun as they head back to hotels to drop their loot or head out to the Gas Lamp district for some food. It is already taxing enough to move through the hordes and stand in mile-long lines within the Con itself, so this extra pain can really add up. The Marriott, on the other hand, is right next door to the convention center. A quick walk and you're in its comfortable air-conditioned lobby. It seems to be where a lot of the more famous attendees stay. David Fury (producer on Buffy, Angel, Lost, 24, etc.) and his kids, and a writer from Family Guy were in front of me in the Starbucks line Saturday morning. Legendary Marvel writer Stan Lee sat a table down from us in the pub. Adam from Mythbusters was in the elevator with us. Erica's Marriott Rewards card got us a free upgrade to a room on the 19th floor, which was quite nice. I'm not sure she entirely made her point though I agree with it. Yes, videogames CAN be Art. Yes, we could be at the early stages of the Art form like we were with cave paintings or early live action shots of film. But I believe Truely artful games are a rarity still not because the medium is primitive. It's because most Game Designers are not truly great. In fact, most get their jobs by starting out as game testers who play the particular games being produced over and over again. This would be like Chefs becoming chefs by eating a particular food over and over. Granted, well acclaimed animation directors at Pixar DO watch old classics over and over, but a large breadth of them, not just the ones they worked on previously. And granted, there are IMHO some truly great Game Designers out there or now part of History. Will Wright, Peter Molyneaux, Shigeru Miyamoto, Keita Takahashi, Richard Garriott, Dani Bunten Berry, Sid Meier many more I don't know about, and perhaps the folks at thatgamecompany will be among them too. Very cool TED Video shown here at TEDx about Natasha Tsakos, a corporeal mime actress who combines nonverbal communication, Foley sound FX, and projected CG animations in her work, in particular her show called Upwake. Reminds me of the work of Robert LePage, with more of a Charlie Chaplin / Buster Keaton performance style. Are you an illustrator, photographer, animator, or DJ? This might be the Macbook for you. No, it's not sold by Apple, but it's licensed by them and is essentially a Macbook Pro made of stronger magnesium vs. aluminum, merged with a very strong 13" glass screen covering a Wacom® tablet. Unlike the Macbook Air, it has your choice of CDROM or Superdrive, and unlike the Wacom® Cintiq line of portable tablet screens, you don't need a Macbook or Mac Mini standing by with a cable. Of course you writers and accountants can hook up keyboards to its USB port if you really want. Pepakura - Make Your Own Figurines! The Internet has spawned a number of sites devoted to papercraft or Pepakura patterns. 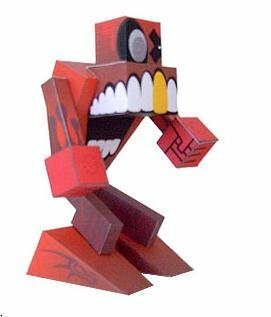 Papercraft is similar to Origami, the Japanese art of making folded paper sculptures, except that it usually involves cutting out shapes and gluing them together. Thanks to technology, we can easily share patterns through Illustrator and PDF files. We can also use 3-D software to automatically flatten the shape into a pattern. 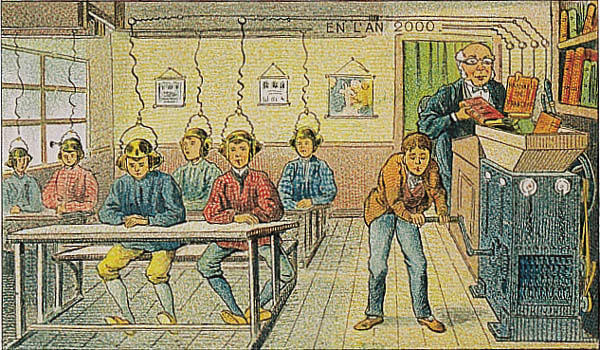 French artist Villenard painted these lovely images of what life might be like in the year 2000. I love this depiction of high tech education -- putting books into a hand-cranked mechanical grinder that converts them into audio-books for children to listen to. The L.A. Book Festival is coming up this week at UCLA. Guests include Henry Winkler, Ray Bradbury, Elizabeth Taylor, Kirk Douglas, Dr. Phil, and Gore Vidal. Sing with me: "One of these folks is not like the others. One of these folks just doesn't belong. Can you tell me which one is not like the others before I finish this song?" UPDATE: I went on Sunday. Randomly, I wore my Avenue Q shirt. The moment I got there, I saw people carrying Avenue Q fans that were being passed out, advertising the fact that it will be coming to Los Angeles soon. Must have had three or more people either compliment me on my t-shirt, or ask where they could get one and the fan. Oh, and I went to the Dr. Phil talk. Take that, you authors-without-daytime-TV-shows!